Passengers flying into Bay Area airports usually spot them out the window: huge, colorful ponds, hugging the shoreline of the bay. The patchwork of brown, green and pink looks like a bizarre quilt. They’re known as the “salt ponds,” and Bay Curious listener Ann Vercoutere has wondered about them since her childhood in the South Bay. Those giant piles of salt actually hold of piece of the Bay Area’s history going back to the Gold Rush and reflect the legacy of environmental change since then. Of course, they also hold a lot of seasoning. 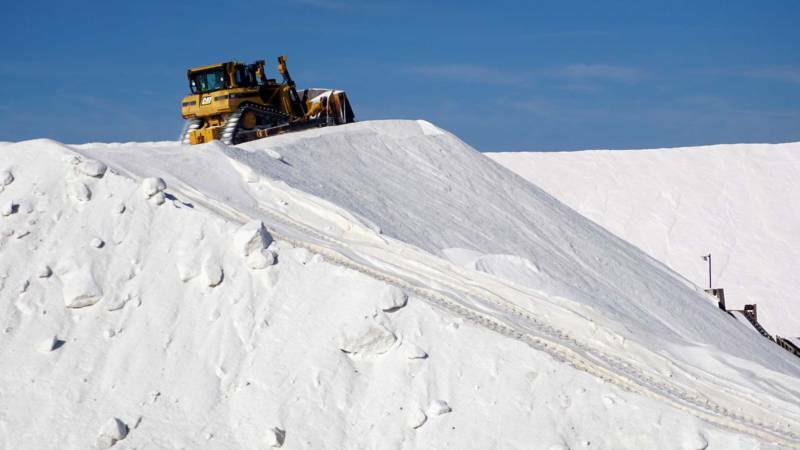 “The salt stack is 80 feet tall and about 800 feet wide,” says Maria Alizo-Martell of Cargill, Inc., standing next to the 500,000-ton pile. By rough estimate, it would season 143 billion bowls of popcorn, give or take, depending on how salty you like it. The piles are at Cargill’s Newark facility, where the final harvest takes place. But it begins in San Francisco Bay. Salty water from the bay is captured in vast ponds, where it starts to evaporate because of heat from the sun and drying by the wind. At first, the ponds are green or brownish in color, like the bay itself. As the salt water becomes more concentrated, it's moved into other ponds where the color becomes more yellowish. Finally, in the last stage, the “pickle” brine, as it’s known, starts turning pink. “We like pink,” says Alizo-Martell with a chuckle, walking across a shallow pond with an inch of pink water. 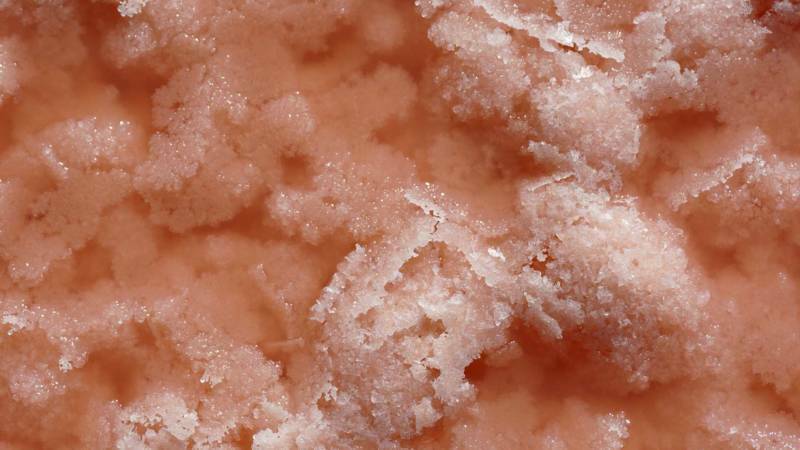 It covers a thick layer of crusty salt and looks like a giant, raspberry snow cone. LISTEN: What Are Those Weird, Pink Ponds in San Francisco Bay? 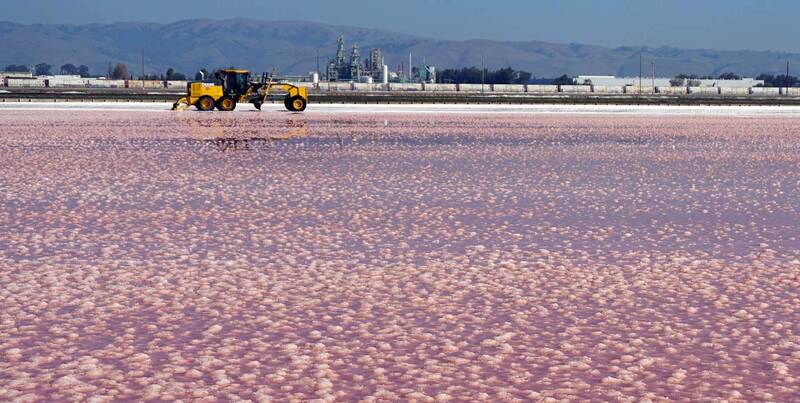 Don’t Call it a "Salt Pond"
The vibrant pink hue comes from a natural source: halobacterium and microscopic algae. As the water gets saltier, some microbes can’t hack it and they die off. But others are specially adapted to salty conditions and they flourish, changing the color of the water. “When they get stressed as the salinity increases, they produce that red color,” says Alizo-Martell. The saltier the water, the redder the microbes get. That color aids in the salt-making process by absorbing sunlight and increasing evaporation. Clear water doesn’t absorb as much light. Once several inches of salt form, Cargill begins the harvest, which lasts from September to December. “It’s just beautiful,” says Alizo-Martell, picking up a handful of the flaky, white cubes. “It’s so weather dependent. You had a bad year, you get not much salt.” A lot of rain slows down the process. In all, it takes three years and a thousand gallons of bay water to produce just one pound of salt. From here, it goes to a refinery where it’s cleaned, sized and sold as sea salt, bearing the Morton’s or Diamond Crystal brand. But only 3 percent of the salt ends up on our table. The rest supplies a huge range of industrial processes, from pharmaceuticals to food production, water treatment and road salt. Salt-making boomed through the 1970s, when Cargill bought the operation. 44,000 acres of the bay were in production then, but today, it’s just 8,000. That’s because the market for salt shifted and so did our view of what San Francisco Bay should be. The salt ponds used to be marshes, which, around the time of the Gold Rush, were seen as wasteland. “There was an encouragement by both the state and federal government to put what they considered wasteland or swamp and overflow lands into economic use,” Mapelli says. Today, the Bay has lost more than 80 percent of its marshes. So, in 2003, the federal and state governments bought thousands of acres of ponds from Cargill. In the biggest ecosystem restoration project on the West Coast, the ponds are being reconnected to the Bay and restored to their original status as marshlands to support wildlife and act as buffers against rising sea levels. For Bay Curious questioner Ann Vercoutere, the ponds are one of the few things that haven’t changed from her childhood in the South Bay. Now, the salt ponds border some of the most expensive real estate in the nation, not far from gleaming tech campuses. The chances of starting a large, industrial salt-making operation in the Bay today are effectively zilch, for financial and environmental reasons. 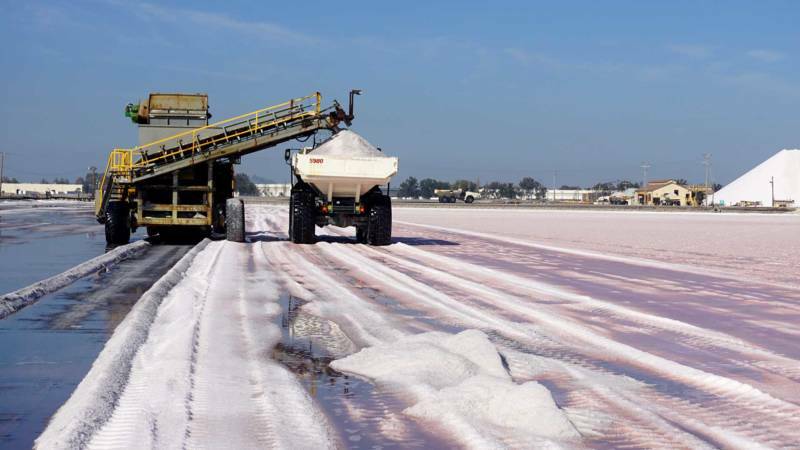 Because of the long, colorful history, Cargill still holds rights to make salt, which really, is the only way salt-harvesting has stuck around amid the intense development pressure of the Bay Area.